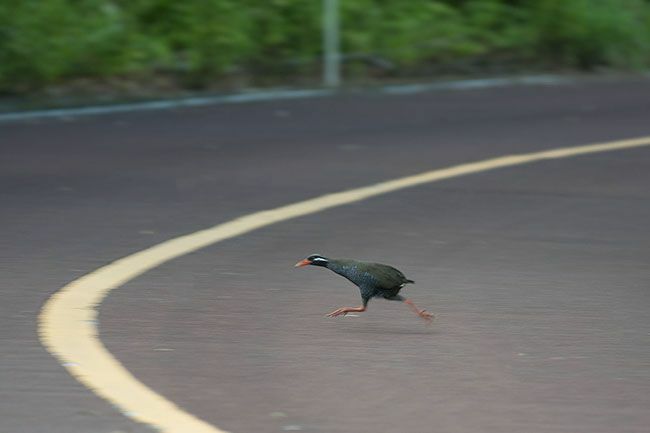 In the previous installment of A Traveller’s Guide to Feathers, I described recent research on the natural history of the Okinawa Rail. Dr. Shun Kobayashi and his colleagues discovered, among other things, that this endangered rail is omnivorous, exploiting a wide range of plant and animal foods, and that they forage in more than one habitat. Wanting to know more about the Okinawa Rail and other threatened wildlife in the area, I contacted Shun Kobayashi, a post-doctoral researcher at the University of the Ryukyus. He responded immediately with great energy and enthusiasm. He pointed out that the Okinawa Rail has become a symbol of Okinawan animal life. Consequently many people in the region are aware of the bird, but many of those are unaware of its plight. Predation by introduced mongooses and cats is likely the most serious source of rail mortality, but habitat loss and collisions with automobiles also contribute. The population fell through 2007, before beginning to recover. Shun Kobayashi told me that the Ministry of the Environment became involved, creating a breeding program, and attempting to remove mongooses from northern parts of the island where their impact on native wildlife is greatest. Consequently, rails are becoming more numerous, although some threats remain. Under the guidance of Professor Masako Izawa, university students continue to consider the natural history of Okinawa Rails. One student tracks individuals in the wild, and another studies captive individuals. The professor’s website describes other work that her group is engaged in. “We conduct research on mammal home ranges, environmental utilization, social structure, breeding behavior, feeding habits… Animals that students have researched… include the Iriomote wild cat, the Tsushina leopard cat, the flying-fox, Cervus nippon keramae, different types of mice, the blue rock thrush, and more.” The University of the Ryukyus has a very navigable website: http://www.u-ryukyu.ac.jp/en/. Shun Kobayashi pointed out that Dr. Kiyoaki Ozaki, a researcher at the Yamashina Institute for Ornithology, has been studying Okinawa Rails for more than thirty years. You can learn more about the Yamashina Institute at: http://www.yamashina.or.jp/hp/english/index.html. Shun Kobayashi explained that his interests were not just for our avian friends, but also for plant pollination systems that depend on mammals, and the ecology of animals that are found only in the Ryukyu Islands. He is, for instance, currently studying the impact of dogs and cats on the native animals of Okinawa-jima Island. I was told that the support of non-governmental organizations, such as the Conservation and Animal Welfare Trust, Okinawa, are key elements in the study of wildlife in the area. “I could not do the research without their support,” wrote Shun. Despair only occurs when no hope remains. I see no need for despair for our natural world as long as people such as Dr. Shun Kobayashi, Professor Masako Izawa, and Dr. Kiyoaki Ozaki believe that there is a future.